This is a guest post by Bret Norwood from Learning-Laboratory. ChecklistRN’s sister project, the Study Putty web app, wants to help you master tedious memorization material, whether for class or for the NCLEX. Rote memorization is horrible…but sometimes it’s just what you gotta do. If your time for cramming has come, we can help you drag yourself through the miserable mire. 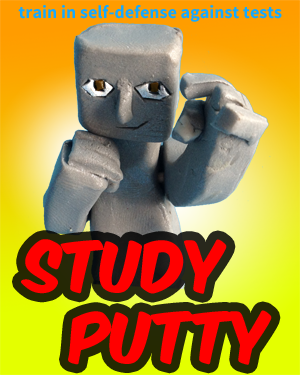 Study Putty is in public beta. Anyone can use our activities for free. We’re still in development, and in particular we don’t have nearly enough content for students of nursing. So for a limited number of participants, on a first-come-first-serve basis, I want to hear what you need to study right now, and I will do my best to slip that content into our nursing topic page as fast as I can–within a day or two. Heck, need to study it tonight? Tell me how urgent it is and I will do my best, but no promises. If you try our site, you’ll notice that we don’t let you (or is it make you?) create your own study materials (unlike our competition). Instead we add content that has been checked by experts in the field or which at least has a reliable, documented source. This helps protect you from tediously cramming the wrong stuff into your overloaded noggin, which may already be running low on disk space. But that means we depend on students and educators to tell us what they need to have on our site. All I ask is that you shoot an email to me, Bret, at bnorwood@sherprog.com describing what you want to study. If possible, include a source for the material–for example a handout, a cheat sheet, a scanned text book page, or a link to a public resource like a Wikipedia article. All I really need is a short description of the material, what class it’s for, and a source, so this is no-pressure correspondence. Don’t be afraid to include a “Hello” or “How’s the weather?” though. Demonstrating our “supportive” Shakespearean feedback system. You can also get in touch by commenting on this page. You get a free, custom study tool on short notice. We get to grow our content to help other nursing students. Sounds like a good trade, right? Not only are you getting something better than the old cheat sheet, but you are helping future students get the job done and get on with life as well!